Stir together the Chex™, pretzels, Cheerios™ and peanuts in a large microwave-proof bowl until well blended. Set aside. In a small bowl, whisk together worchestershire sauce, melted butter and seasoned salt until combined. Slowly drizzle the sauce over the cereal mixture, stirring well so that it is evenly coated. Microwave the mixture for 6 minutes, pausing every 2 minutes to take out the mixture and give it a good stir. Once cooked, lay out the mixture in an even layer on wax or parchment paper (or baking sheets) to cool. Once cooled, stir in the candy corn and cinnamon candies. Serve immediately, or store in an airtight container for up to 2 weeks. When you’re traveling for the holidays, bringing food with you can be a challenge. Here are some nom eats that pack, ship and carry well. This will be my first holiday season where I will be traveling for both Thanksgiving and Christmas. I can’t wait!!! However, I realized I should probably start planning ahead for some recipes that can easily travel with me via car or plane. One that I will definitely be bringing to our family’s gathering on Thanksgiving is some classic homemade Chex mix. My mom used to make it for us growing up all the time because our family was slightly obsessed with it. I always loved making a batch together around the holidays, or just loving the surprise when I came home after school to a house filled with that amazing smell of a fresh batch. So good! During the autumn, one of my favorite ways to mix up the recipe is to add in some candy corn (or sometimes candy pumpkins) and whatever various cinnamon candy sounds good. 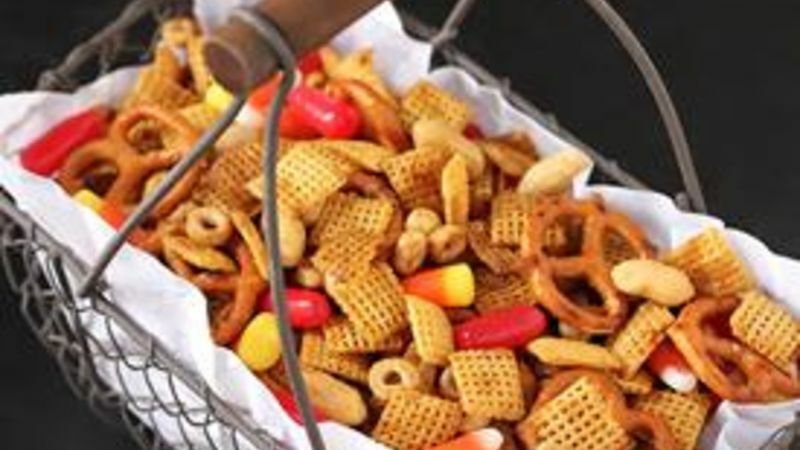 I just love the combination of the salty Chex mix, sweet candy corn, and cinnamony candy. And judging by how quickly a batch disappears around family and friends, I’d say that everyone else loves it too! So here is the Autumn Chex Mix recipe, along with some other great ones to consider sending to troops overseas or bringing along with you in your holiday travels. Begin with the namesake of this classic mix – Chex cereal! Stir together the Chex cereal, pretzels, Cheerios and peanuts. Then, in a separate bowl, whisk together the worcestershire sauce, seasoned salt and melted butter, and then drizzle that over the cereal mix. Give it a good stir while you drizzle to make sure everything is coated evenly. Then microwave for 6 minutes, stirring every 2 minutes. Once the mix is cooked, let it cool spread out on some sheets of wax or parchment paper (or you can use baking sheets). Once the mixture is cooled, toss in the candies, and then serve it up! I dare you to resist sneaking a few bites while it cools. (I never can!) Enjoy! Here are 9 more “traveling” recipes to consider this holiday season. Remember the soldiers, college students and shut-ins on your list! Click on photos or titles to go to recipe pages. If you are traveling with snacks or cookies, or if you are mailing them to anyone for the holidays (especially our troops overseas! ), be sure that you eliminate absolutely any wiggle room when you pack the food so it arrives in perfect condition. Whether it’s a suitcase being tossed around in baggage claim, or a box being mailed overseas, the last thing you want is for someone you love to open up a box full of crumbs! So be sure to use your expert packing skills and get everything nestled in nice and tight, and off you go!